AAK processes various vegetable oils, including 1.7 percent of the world’s palm oil. AAK handled, traded and processed 1.3 million tonnes of palm oil in 2017, a 53 percent increase from 2013 (0.84 million). AAK primarily purchases refined palm oil, which it processes into specialized vegetable oils and fats for consumer goods products. Consumer goods companies that buy palm oil products from AAK include Unilever, Nestlé, PepsiCo, Mondelēz International, Kraft Heinz, General Mills, Mars, Danone and the Hershey Company. AAK has a group policy on sustainable palm oil and commits to HCV and HCS standards. It is a founding member of the Roundtable on Sustainable Palm Oil (RSPO). The company publishes and regularly updates a list of supplying mills. Its Mill List Grievance Addendum, published in December 2018, provides information about the status of 35 issues at mills that feature in AAK’s supply chain. The implementation of its NDPE policy falls short of sector best practices. AAK places the responsibility for addressing NDPE non-compliance with its Tier 1 suppliers, but does not name them. AAK may source from large “leakage” refiners and traders in Indonesia and Malaysia that do not have robust NDPE or responsible sourcing policies. The company also does not identify producer groups or apply its policy on company group level. As a result, AAK may inadvertently be part of the leakage market. AAK’s palm oil purchases are linked to at least 10 palm oil producers and/or refiners/traders that are non-compliant with best practice NDPE standards. These companies include the Prosper Group (Tee family), Just Oil & Grain Pte Ltd, Sarawak Oil Palms (SOP), Darmex Agro/Duta Palma, Dupont & Leosk and related parties, Evershine & Everbright, Incasi Raya, Musirawas, PT Sisirau and Samuel International. AAK faces substantial revenue risk and limited financing risk as a result of its sustainability shortcomings. If AAK were to upgrade the transparency and NDPE status of its supply chain, the extra annual costs could total USD 5-10 million. That amount would lead to a value loss equal to two percent of AAK’s market capitalization. Otherwise, market access risk could lead to a value loss of between 15 and 30 percent of its market capitalization. 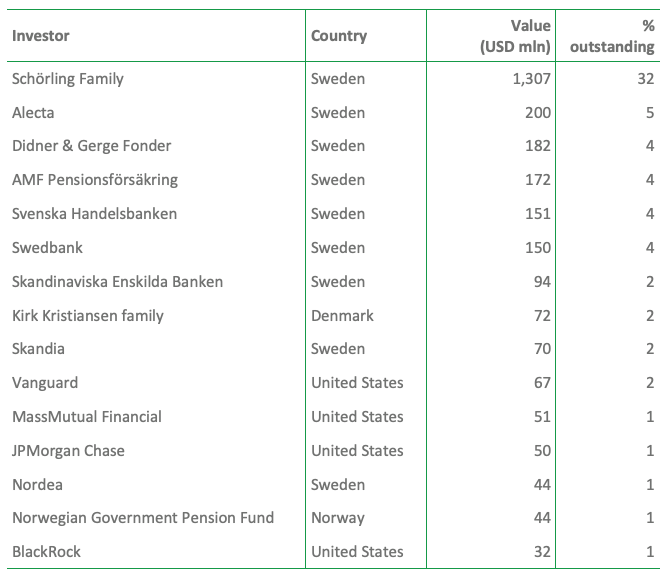 Of its financiers, particularly HSBC, Danske Bank and the Norwegian Government Pension Fund face conflict with their forest policies. Due to AAK’s balance sheet strength, the risk of volatility in the cost of capital is small. Food ingredients (67 percent of net sales in 2017). This segment supplies the bakery, dairy, foodservice and special nutrition industries. Chocolate and confectionery fats (28 percent of net sales in 2017). This segment provides value-adding speciality fat solutions to the global chocolate and confectionary fat sectors. This division also includes a unit for personal care companies. Technical products and feed (5 percent of net sales in 2017). This division offers fatty acids and glycerine for various applications, and proteins and fats for animal feed. AAK handled/traded/processed 1.3 million tonnes of palm oil in 2017, the equivalent of 1.7 percent of the world’s total palm oil use of 76.6 million tonnes. Its palm oil use is equal to that of the consumer goods giant Unilever. In its annual report 2017, AAK states: “We obtain our raw materials from rapeseed, palm, soya, shea, sunflower, olives, and many other sources.” Palm oil (including the kernel) volumes corresponds at least 60 percent of all oils used, as shown in the figure below. Over the last five years, AAK’s use of palm oil has increased sharply. In 2013, it handled 0.84 million tonnes. In 2017, the company’s palm oil use had climbed by 53 percent, to 1.29 million tonnes. 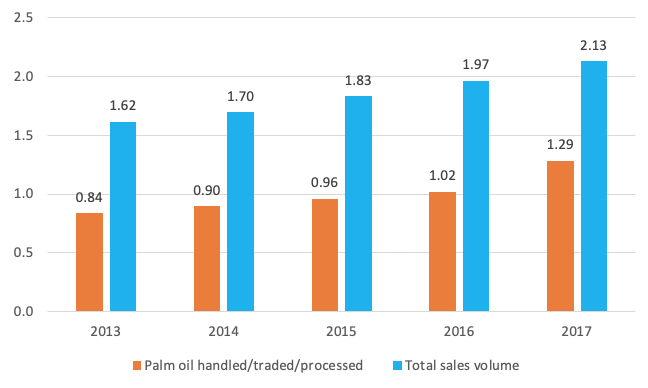 AAK’s increasing palm oil use since 2016 is due to organic growth and new plants and acquisitions. In September 2015, AAK bought a 51 percent share in an Indian company that is now called AAK Kamani Ltd. In early 2016, AAK opened a new facility in Jundiai, Brazil. Later that year, AAK bought the California Oils Corporation and completed the construction of an edible oils factory in Zhangjiagang (China). AAK primarily purchases refined palm oil, which it further processes to develop specialized vegetable oils and fats for consumer goods products. As such, the company is positioned in the midstream segment of the palm oil supply chain. Its direct suppliers include some of the world’s largest refiners of Crude Palm Oil (CPO), whereas its customer base consists of consumer goods companies. Consumer goods companies that report buying palm oil products from AAK include: Unilever, Nestlé, PepsiCo, Mondelēz International, Kraft Heinz, General Mills, Mars, Danone and the Hershey Company. AAK has a group policy on sustainable palm oil. Through this policy, it commits to source “palm oil that has been produced without conversion of High Conservation Value (HCV) areas, High Carbon Stock (HCS) forest or destruction of peatland, and where plantation development only takes place with the free prior and informed consent of any affected local community.” On its website, AAK states that by 2020, all palm oil, palm kernel oil and derivatives should meet AAK’s policy requirements. AAK is a founding member of the RSPO and has been an active member since 16 May 2004. In 2017, one-third of its handled/traded/processed palm oil was RSPO-certified. It sources 94 percent of its volumes from suppliers that are members of the RSPO. AAK has published and regularly updates a list of mills that feature in its supply chain. This list is based on information that the company receives from its Tier 1 suppliers and features over 1,100 mill names. It includes information about the parent company of the mill, the location and RSPO status. In addition, AAK published a Mill List Grievance Addendum in December 2018, providing information about the grievance status of 35 sustainability issues at company groups that featured in AAK’s supply chain. These cases have been highlighted in public NGO reports. AAK works with a “key supplier” in Malaysia on improving labour practices in their third-party supplier mills. The focus has been on 50 high-priority mills, categorized as such because of the volumes they supply and their lack of policy commitments at parent group level. However, no public document yet exists that registers the outcomes of the project. In 2017, AAK engaged in a smallholder project in Malaysia through the organisation Forever Sabah. In its pilot phase, the project aims to reach about 2,000 independent smallholders in 20 villages. One of the goals is to improve the livelihood of the smallholders by employing better management practices. AAK ranks 24th on the Sustainability Policy Transparency Toolkit (SPOTT) benchmark, with a transparency score of 66.7 percent. 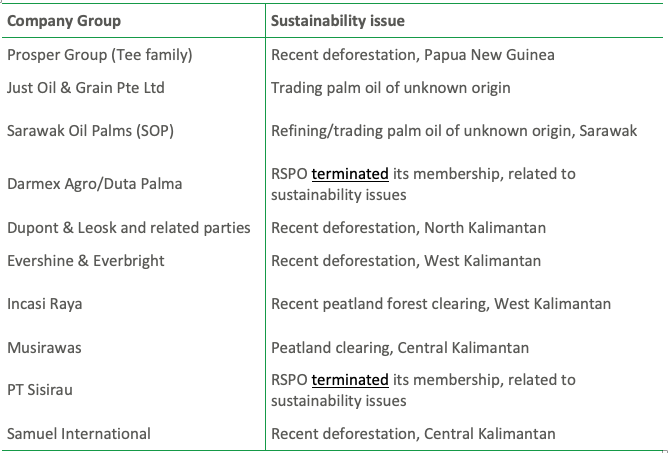 SPOTT assesses palm oil producers and traders on the public disclosure of their commitments to environmental, social and governance (ESG) issues. The full palm oil indicator framework contains 119 indicators across 10 categories, aligned with corporate reporting initiatives. The latest score card of SPOTT (November 2018) lists 70 palm oil producers and traders. Whereas AAK has an NDPE policy and long track record of working towards sustainable palm oil, the implementation of its approach falls short of sector best practices in several ways. AAK places the responsibility for addressing NDPE non-compliance at its Tier 1 suppliers. In its sustainability progress report of August 2018, AAK states: “Transformation depends to a large extent on just a handful of major processors which control a large part of the market.” When AAK notices a concerning sustainability issue, it sends a notice of grievance to its suppliers, which may already be aware of the issue. In December 2018, AAK published its first grievance list that shows alleged links to deforestation, peatland clearance and human right abuses by the producer groups from which it (indirectly) sources. AAK provides no transparency about its Tier 1 suppliers. Given its position in the supply chain, its suppliers likely include a selection of the 10 largest palm oil refiners/traders globally. Most of these refiners/traders have NDPE policies and have published a full list of upstream operations from which they source. The Hayel Saeed Anam (HSA) Group is the only notable exception. AAK may, however, also source from large “leakage” refiners/traders in Indonesia and Malaysia that do not have robust NDPE or responsible sourcing policies. Examples of such companies include the Best Group, Intercontinental Specialty Fats (ISF)/Nisshin Oil and Permata Hijau. 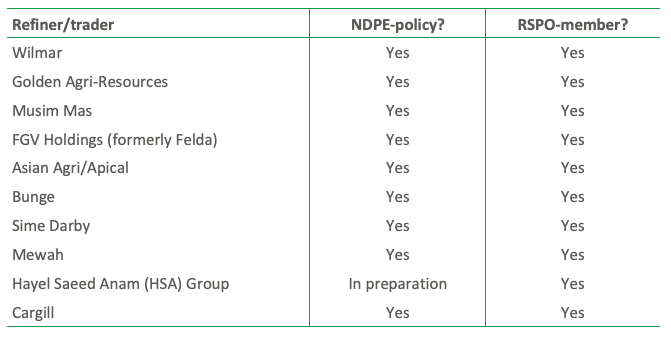 Whereas the latter has an NDPE policy, it has not published any specific details about its implementation. As a result, AAK may inadvertently be part of the leakage market. Should any of its unnamed Tier 1 suppliers fail to take adequate action over NDPE non-compliance, AAK’s current approach may be insufficient to exclude unsustainable palm oil from its supply chain. AAK may be sourcing palm oil from mature plantations that are owned by the same companies or individuals that are involved in deforestation activity. Whereas best practice NDPE policies are applied at a company group level, AAK does not have a mechanism to identify such deforestation and the producer groups behind it. While AAK knows the mill origin for 97 percent of its palm oil use, it has not identified all producer groups behind these mills or the other assets such groups may hold. The company remains dependent on NGOs or the major refiners, traders and consumer goods companies within its supply chain to identify breaches of its own NDPE policy. AAK is exposed to the risk of being linked to unsustainable practices in palm oil production. This issue could affect its reputation and even its customer base. The well-known consumer goods companies that AAK supplies all have NDPE policies. AAK’s NDPE shortcomings may lead to customers shifting to competitors with stronger policy implementation. In September 2018, Greenpeace’s report “Final Countdown” identified deforestation by 25 major palm oil producers since 2016. It concluded that most of these palm oil producers were still selling palm oil to major refiners, traders and consumer goods companies. Since the Greenpeace report, main refiners and traders have accelerated their engagement. The results include exclusion of producer groups and agreements from producer groups to stop clearing and conduct HCV and HCS assessments. Recent statements by Mondelēz International (a main customer of AAK) and Wilmar (the world’s largest trader/processor of palm oil) are examples. Greenpeace reported that AAK was sourcing from 18 of the 25 palm oil producers identified to be deforesting since 2016. This finding was based on AAK’s May 2018 Public Mill List. After the publication of Greenpeace’s report, AAK publicly declared that it no longer sources from at least three of the 18 producers groups mentioned by Greenpeace: CAA, GAMA and Indofood. In its December 2018 Grievance List, AAK also mentions several engagement outcomes. AAK is still “considering suspension” of the Prosper Group (Tee Family), but engagement outcomes by main traders and refiners with this company for clearing forests in Papua New Guinea have not yielded positive results. AAK is also sourcing from nine additional palm oil producers, refiners and traders that may be NDPE non-compliant but were not mentioned by Greenpeace. These nine companies do not appear on AAK’s December 2018 Grievance List. AAK may not be aware of issues with these companies, and it may not be screening its supply chain for sustainability issues by producer groups from which it is sourcing. 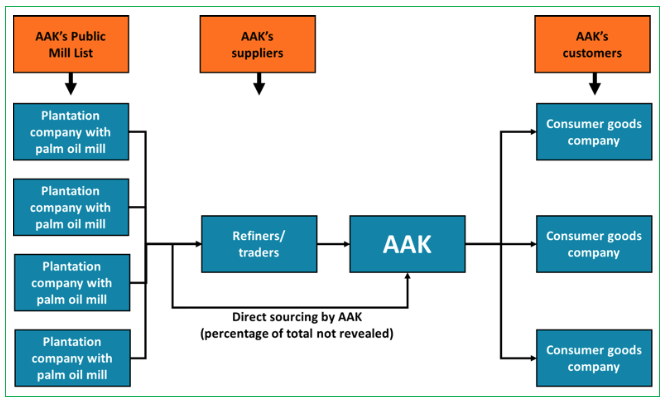 Figure 4 shows the ten controversial palm oil producers in AAK’s present supply chain. AAK has indicated to Chain Reaction Research that it intends to remove Darmex Agro/Duta Palma from its supply chain shortly. In India, AAK has a 51 percent stake in the company AAK Kamani Ltd. Trade data show that in the first eight months of 2018, AAK Kamani imported 66,700 tonnes of palm and palm kernel oil. These imports include purchases from Just Oil & Grain Pte Ltd, and Sarawak Oil Palms. Both are considered leakage players: They neither provide evidence of policy implementation, nor have any NDPE policies in place. In its latest RSPO Annual Communications of Progress 2017, Just Oil & Grain Pte Ltd (JOG), a large Singaporean palm oil trader, reported to have handled 937,000 tonnes of palm oil and palm oil products. JOG is a 10 percent daughter of Charleston Holdings Pte Ltd (Charleston). On its website, Charleston describes JOG’s NDPE policy. JOG has, however, not published any specific details about the implementation of its policy. For example, the company does not reveal its suppliers, and no grievance procedure is visible on its website. Trade data show that in 2017 JOG functioned as a leakage company. It purchased palm oil from the palm oil companies Austindo Nusantara Jaya and Sumbermas Sawit Sarana, after major refiners and traders with NDPE policies had stopped purchasing from these leakage companies. Sarawak Oil Palms (SOP) is the second largest private palm oil company in Sarawak, after Rimbunan Hijau. At the end of 2017, SOP had an oil palm landbank of 120,000 ha with some 88,000 ha planted with oil palm. The forestry company Shin Yang is the main shareholder of SOP, while it also has palm oil interests outside SOP. SOP is also the 100 percent owner of a refinery and kernel crushing plant. The refinery has a capacity of 450,000 tonnes of CPO per year. SOP has a Singaporean subsidiary for trading purposes. This company, Asia Oils Pte Ltd, exported to AAK Kamani in the first eight months of 2018. In its December 2018 Public Mill List, AAK reports that it sourced from at least five palm oil mills owned by Sarawak Oil Palms. SOP provides limited transparency — and therefore also limited accountability — with regard to its oil palm operations. It does not have an NDPE policy, and its refinery and mills are also supplied by third parties. The origin of the palm oil SOP to AAK Kamani remains unclear, and thus SOP is a likely leakage source for unsustainable palm oil. Business assets controlled by the Malaysian Tee family are commonly known as the Prosper Group of companies. Their publicly listed plantation entity, Far East Holding Berhad (FEHB), is owned by two main shareholders: Prosper Trading Sdn Bhd and LKPP Corp (Pahang State’s Company for Agriculture Development). The Prosper Group is not a legal entity. Instead it includes several different companies that are minority- and majority-owned by the Tee family. These companies include eight palm oil mills in Peninsular Malaysia which supply to large traders with NDPE policies. AAK purchases palm oil from the Prosper Group’s Cheekah-Kemayan Plantations Sdn Bhd, Endau Palm Oil Mill Sdn Bhd, Kilang Kosfarm Sdn Bhd, Kilang Sawira Makmur Sdn Bhd, Prosper Palm Oil Mill Bhd, Rompin Palm Oil Mill Sdn Bhd and Wujud Wawasan Sdn Bhd. The same members of the Tee family involved in Far East Holdings Bhd and the eight palm oil mills are also the owners of a controversial plantation development in Papua New Guinea. The Bewani Oil Palm Plantation covers a Special Agricultural Business Lisence (SABL) of 139,909 ha in Vanimo, West Sepik province, near the border with Papua. The development has proved controversial, for two main reasons. The project has been accused of irregularities in the permit process and of taking land without local people’s consent. In June 2013, the PNG Commission on Inquiry on SABLs recommended that the Bewani SABL should be revoked. In March 2017, Papua New Guinea’s Prime Minister repeated an earlier statement that all SABLs issued have been declared illegal and operations should be stopped. The mill on the plantation started operation in the middle of 2018 and the prime minister formally opened it, according to reports, despite his earlier statement that the SABLs were illegal. The plantation also contains extensive areas of primary and secondary forest that would likely be designated as HCV or HCS. However, development began without any of these assessments taking place, and deforestation on the plantation has been ongoing. 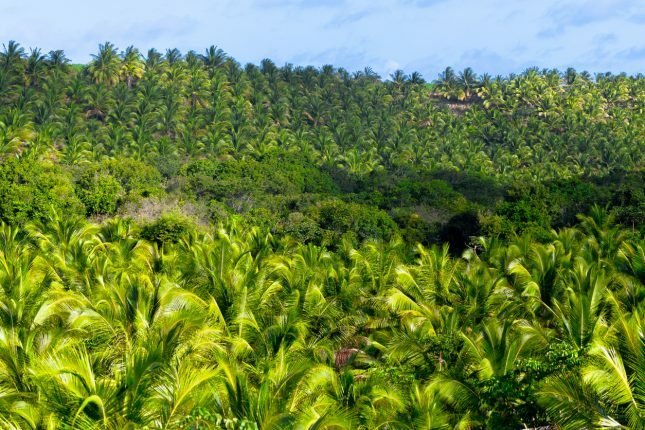 Since January 2014, approximately 12,500 ha of forest has been cleared on the plantation. Between March 2018 and November 2018, around 2,200 hectares of forest were cleared (see figure below). The company plans to plant oil palm on 20,000 ha of land by 2019. Revenue-at-risk: The damage AAK’s clients would suffer in terms of reputation might lead them to put pressure to AAK to monitor its supply chain more vigilantly or consider ending relations with the company. Financing risks: shareholders and banks may engage with the company and the cost of capital may increase. In the last five years, AAK’s net revenues increased with an average annual rate of 4.1 percent from USD 2.5 billion (2013) to USD 3.1 billion (2017). During the same period, the company’s profitability also increased as EBITDA and net profit rose by an average annual rate of 3.6 and 4.5 percent respectively (Figure 7). 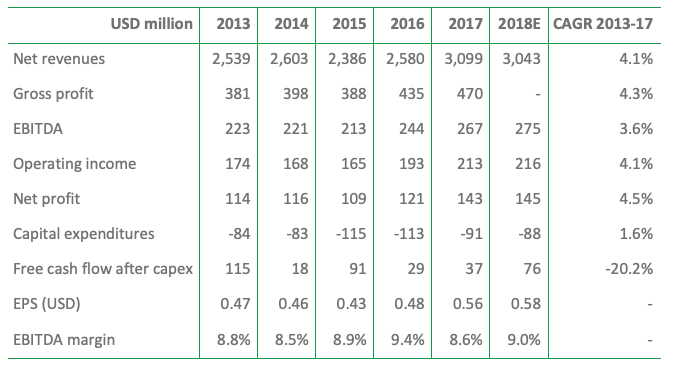 The increase in AAK’s total net revenues mirrors the increase in net revenues of its two largest production segments — food ingredients and chocolate and confectionery fats — over the past five years. AAK saw average yearly increases of 4.5 and 6.5 percent respectively for food ingredients and chocolate and confectionery fats in terms of revenue as the company increased the volume of its production in both those segments. In an environment in which AAK sources 100 percent NDPE palm oil and in which it monitors its supply chain more proactively, the company would have to spend several millions of US Dollars extra to set up an organization which improves the supply chain monitoring. With 25-50 FTEs, the cost may total USD 5-10 million. Another way to calculate these costs is to look at a scenario in which AAK buys the remaining 16 percent of its palm oil also from suppliers that have zero- deforestation policies. Taking as a proxy the USD 35 price premium for RSPO-certified palm oil over conventional palm, AAK would have to buy 16 percent of its palm oil with a five percent premium (palm oil price at the end of FY2017, USD 679). The company is sourcing 1.29 million tonnes of palm oil. If the five percent price premium would be carried to 16 percent of them, AAK would have to spend USD 7 million more, leading to higher costs of sales and a lower gross profit (assuming AAK is not able to raise sales prices). Note that these costs are in the USD 5-10 million range mentioned in the first bullet. Assuming that USD 7 million is a close estimate of the extra NDPE costs, AAK might lose USD 70 million in value in a discounted cash flow calculation. This estimate corresponds to two percent of the company’s enterprise value and two percent of its market cap. Between 40 to 80 percent of AAK’s clients have a zero-deforestation policy. However, some of AAK’s clients may choose to engage with AAK instead of opting for a different supplier. Therefore, the market loss could be lower at 20 to 40 percent. Losing market share could result between USD 620 and 1,239 million in revenue-at-risk and between USD 97 and 195 million in gross profit-at-risk assuming gross margin stays at 15.7 percent, which is the average gross margin over the last five years. Assuming EBITDA margin stays at 8.8 percent (which is the average EBITDA margin over the last five years), EBITDA-at-risk would total between USD 55 and 110 million. In a discounted cash flow calculation, AAK may lose between USD 548 and 1,097 million. This amount corresponds to between 13.9 and 27.8 percent of the company’s enterprise value and between 15.1 and 30.2 percent of its market cap. When comparing the estimated financial impact due to a potential market loss and the estimated impact due to increased costs (operational business risk), it is more financially attractive for AAK to improve the monitoring of its supply chain and implement its already established NDPE policies. Of AAK’s enterprise value, 92 percent consists of the market capitalization of equity and 8 percent is net debt. The company has relatively low net debt and the net debt/EBITDA ratio was 1.1x for 2017 and stable the last three years (Figure 9). In the two scenarios discussed, AAK could lose between USD 55 to 110 million of its EBITDA due to market loss risks. The net debt/EBITDA ratio could then potentially rise to 1.9x. A higher net debt/EBITDA ratio could result in higher interest costs and a higher weighted average cost of capital (WACC). An increase in the WACC may further depress the market capitalization of AAK. An increase in the WACC by 50 basis-points may reduce AAK’s Enterprise Value based on a Discounted Cash Flow calculation by five to ten percent. On December 10th, 2018, AAK issued a three-year senior unsecured bond for a total of SEK 1.1 billion (USD 121 million). The bondholders are not yet available at the time of writing this report. The underwriters of the bond are Svenska Handelsbanken (Sweden) and Nykredit Association (Denmark). AAK is listed on the Stockholm Stock Exchange, and the Schörling family holds 32 percent of the shares. Swedish financial institutions follow, holding between 2 and 5 percent of AAK’s shares. The US-based Vanguard, MassMutual Financial, JPMorgan Chase and BlackRock hold between 1 and 2 percent of the company’s shares. (Figure 10). Although shareholders of AAK do not have zero-deforestation policies, some (Alecta, Skandinaviska Enskilda Banken, Vanguard, MassMutual Financial, JPMorgan Chase, Nordea, Norwegian Government Pension Fund and BlackRock) are signatories of the New York Declaration on Forests – which is committed to cutting forest loss in half by 2020 and ending it by 2030. The Norwegian Government Pension Fund has already excluded 30 palm oil companies from its portfolio. AAK’s P/E ratio for 2019 is estimated at 22.6x, while its EV/EBITDA ratio at 12.8x. When compared to its peers, AAK’s P/E and EV/EBITDA estimated ratios for 2019 are relatively low, at 15 and 27 percent below the average respectively (Figure 11). As analyzed in the market risk scenarios (see Figure 9), with an estimated EBITDA loss between USD 55 and 110 million, the impact on EV/EBITDA ratio would be such that AAK would meet the peer group average. Scenario I would lead to a multiple EV/EBITDA ratio of 15.7x, while scenario II to 20.3x for 2019.